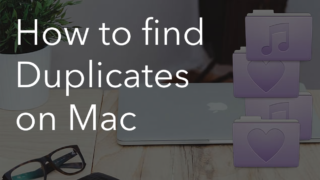 Searching for duplicate files on a Mac is not quick and simple. 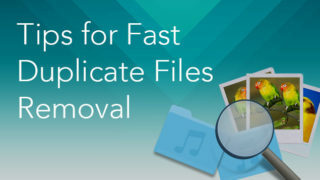 There are a variety of special apps to make finding duplicate files faster and easier. But, you can stumble upon a bunch of paid or free software, and as a result, get confused. 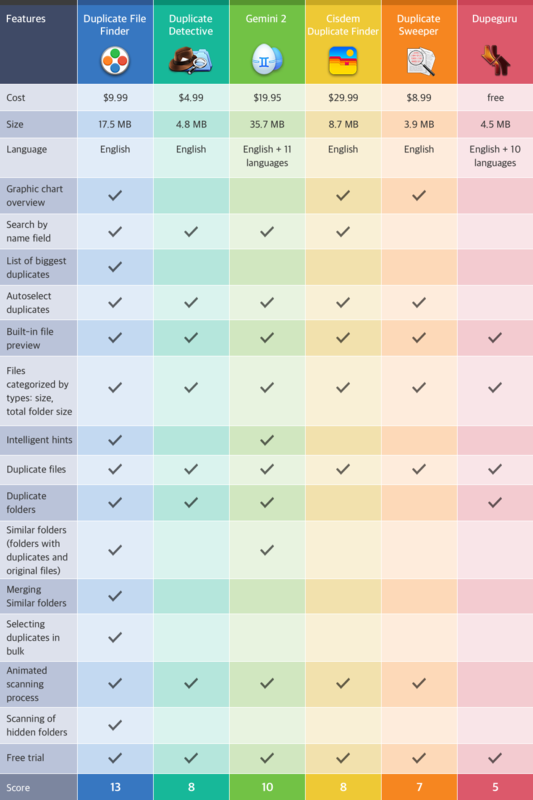 Especially for you, we have prepared a comparison chart of the most popular duplicate searching applications to help you make the right choice. Now, let’s have a look at these six duplicate finders in detail so that you can make your own decision about which one to use. 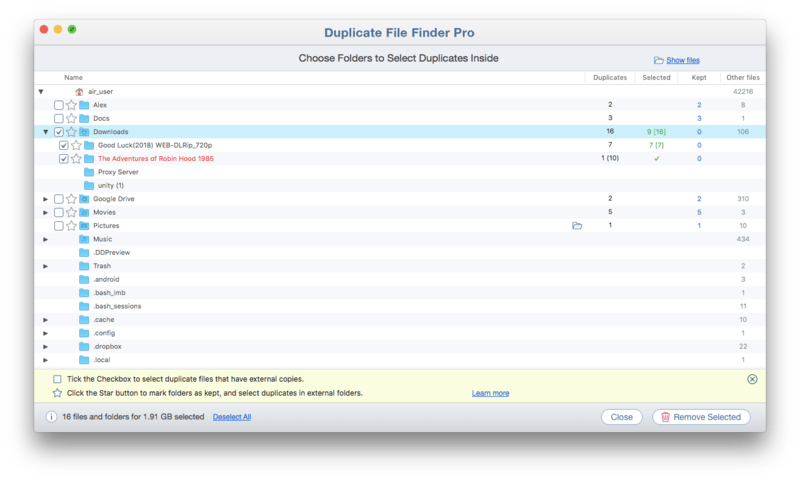 The Duplicate File Finder application was created by the Nektony company, which specializes in increasing Mac productivity. This application helps to remove duplicates in just a few minutes. 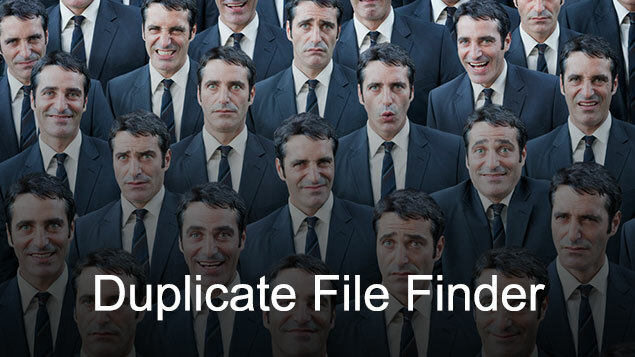 Duplicate File Finder scans your Mac hard drive or external drives to find identical files and folders. It searches equal files by type, name, count, and size. 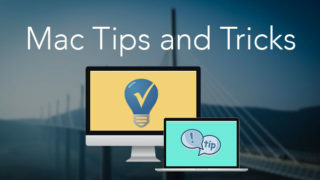 This application is easy to use and it provides a “how to use” guide for new users. Launch the application and click on the Scan Home Folder button for a quick start. Or you can select particular folders you want to scan by using the Add button or dragging and dropping items to the app’s window. Then just click on Scan. In less than a minute you will see the app’s main window, where the duplicates are shown by type in a pie chart or a bar chart. There are several tabs named by the category of files at the top bar of the main window. Click on them to overview the items, arranged by size. Select an unneeded copy of a file and click on the Remove Selected button. Review the item you are going to delete and confirm removal. The file will be moved to Trash on your Mac, so you can restore it or delete completely. Use Cleanup Hints for a fast start. If you wish to get rid of useless twin files to increase the storage space on your Mac hard drive quickly, you should try Cleanup Hints. This is a list of recommendations in the main app’s window, where you can see files recommended for removal and the size they occupy on your Mac. Click on one of the Cleanup Hints → overview duplicate files → click on the Remove Selected button → overview the items you are going to delete → click on the Remove button. Select Duplicates in Folder for a quick removal. If you overview the items in the All Duplicates list, you will notice that twin files appear in some folders more often than in others. 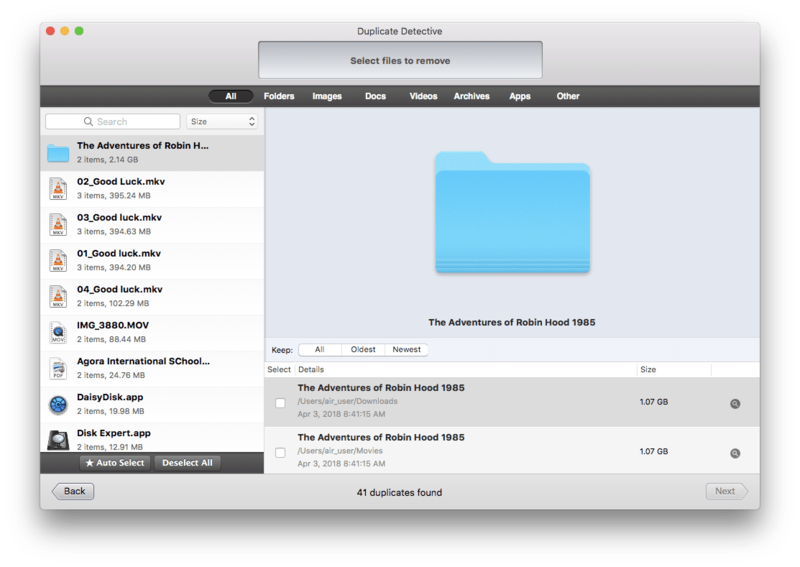 For instance, Duplicate File Finder has found exact files in the Downloads folder on your Mac several times. You can remove items in each category of files from the Downloads folder step by step. However, the fastest way is to click on the Select Duplicates in Folder button and remove all useless duplicates in Downloads at once. The Duplicate File Finder app also finds similar folders. 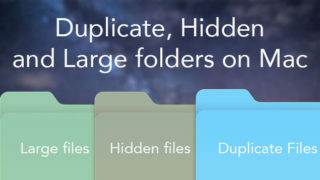 The Similars means that the folders contain unique and duplicate files, which make them alike. In case you find similar folders on your Mac, Duplicate File Finder offers to merge these kinds of folders. After merging, the folders become equal. Now you can just delete one of the unneeded duplicate folders and without worrying about losing unique files. It helps you to get rid of useless files quickly, and simply organize your data. The free version of the Duplicate File Finder will show you Similars, but you will only be able to delete them in the Pro mode of the app. Duplicate File Finder provides the opportunity to view your removal history and restore deleted files. Go to Duplicate File Finder menu bar → Duplicate → Restore Removed Duplicates → Overview the list of the removed items in the Removal History → Select files you want to recover → Click on the Restore button. In Preferences, you can configure additional settings to find duplicates. For instance, you can determine which folders and files should be excluded from the list, set the priority folders for the Auto Select feature, or select the minimum file size for searching. This will help to speed up the process of removal of duplicates and increase the usability of the application. The Duplicate Detective application is the product of the FIPLAB company. They create mobile and desktop apps, which help to organize your work on a Mac. 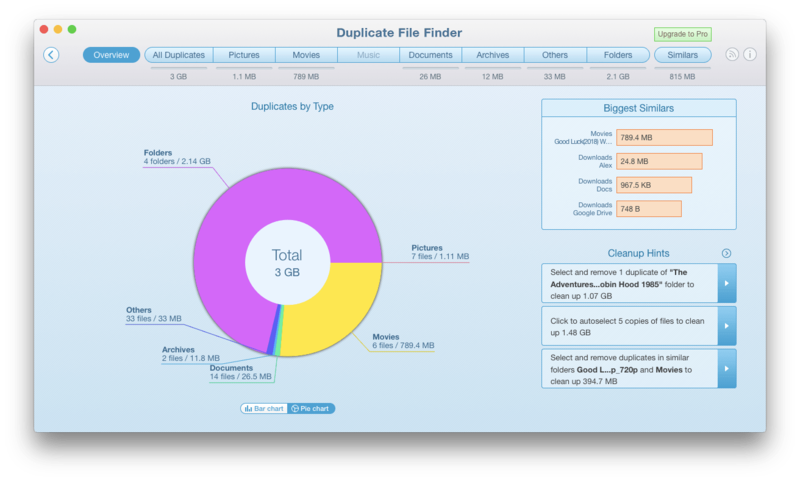 Duplicate Detective scans items by type, name, count, and size to detect duplicate files and folders on your Mac. You can download Duplicate Detective from the App Store for $4.99, or download a free trial from the FIPLAB website. This duplicate finder has a simple interface and most users will easily get started with it. There is a Plus icon on the start window. Use it to select the folders you want to scan and then click on the Start Scan button. On the next step, the app will display an information about how many files were scanned, the number of duplicates it detected and the space duplicates take on your disk. Then you can overview the list of twin files and remove them. Duplicate Detective displays duplicates by file categories, so you can, for example, look through duplicate pictures or duplicate videos for your convenience. All you need to delete duplicates is to select them → click Next → overview the list of selected files and confirm removal. The files will be moved to Trash. Please note that the trial mode of the Duplicate Detective app does not allow you to remove items. It is possible in the paid version of the app only. You can add items to the Ignored File Extensions and Ignored Folders lists before the scanning in Preferences. Gemini 2 is an application by the MacPaw company, which focuses on the products for Mac. 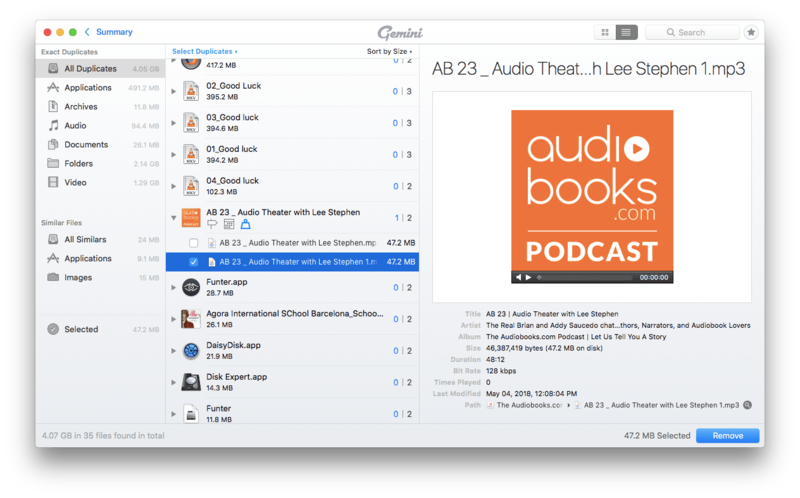 This app scans files and folders on your Mac and detects twin and similar files. It has a simple interface, which looks like the Apple’s Finder design. Click on Review Results if you wish to skim all equal and similar files, and then remove them. At the next moment, you will see the app’s main window with the categories of duplicate files and similar files. All twin files are selected automatically by location, date of last modification and size of a file. Click on Smart Cleanup to delete them. Or Deselect All and manually choose the items you wish to delete and then click on the Remove button. All deleted files will be moved to Trash. The Smart Cleanup option for fast cleaning. This application provides the Smart Cleanup option, which is useful for users who want to get rid of duplicates quickly without reviewing them. You do have an opportunity to review the deleted items and put them back. For this, click on the Review Trashed button → Put All Back → Done. Gemini 2 also finds Similar Files. This means that the app finds files with common parameters that slightly differ from each other. For instance, the images can be taken in the same location by one camera, with a difference of just 2 seconds. So, the app will allow you to look at these similar photos, in case you wish to remove one of them. You can set the scanning process in Preferences, depending on your needs. Click on Ignore List to add files, folders, and files of particular extensions you want to skip during the scanning. You can also create a list of folders where Smart Cleanup has to remove duplicates, and a list of folders from which duplicates should never be selected. 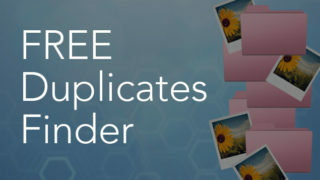 Note that the free trial of the Gemini 2 application allows you to clean up 500 MB of duplicates only. The Cisdem company provides different applications for Mac users, including the Cisdem Duplicate Finder app. It scans your Mac files and folders to find equal and similar files. You can download Cisdem Duplicate Finder from the App Store for $29.99 or try its free trial, which is available at the Cisdem website. This application has a simple interface, takes up 8.7 MB, and is suitable for OS X 10.10 or later. The process of finding duplicate files using this app is almost the same as with previous ones. You need to drag and drop folders to its’ start window or the Plus button. 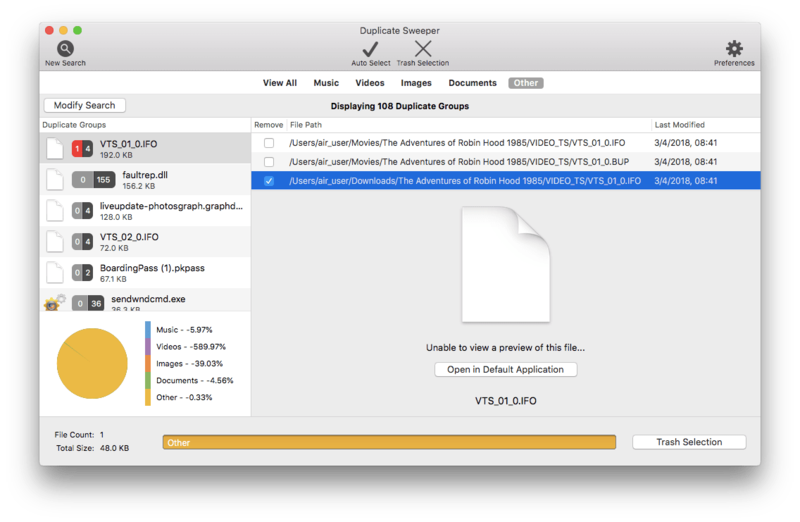 In several minutes, the app will show you the results: a number of scanned files, number of found duplicates, and the space they occupy on your Mac. Then you can overview all duplicates in details. There is a top bar on the main window, where all duplicates are divided by category. Note that the app selects duplicates automatically, so you can just click on the Remove button to delete all detected twin files. There is no “deselect all” button, so you have to overview all items carefully before removal. All files will be moved to Trash if you have selected this option in the app’s Preferences. The scanning process may take some time. It depends on the options you have chosen in the Preferences. You can scan by File Content or File Name and vary the size of scanning files. It also depends on how many folders you are going to scan. It is better to scan your Mac Home Folder or other data in batches. You can create an Ignore List of files, folders and files of particular extensions before the scanning process. The Images category in the Cisdem Duplicate Finder main window has two sections: Duplicate and Similar. By default, Image Similarity sets on 70% in the app’s Preferences. The closer you put the slider to zero, the more “similar” items you get. Unfortunately, the app detects very different files as similar, so be careful with this option. Within 90-100% it finds files that differ quite a bit. Note that the free trial of the Cisdem Duplicate Finder does not allow you to delete duplicates. It is only possible in the paid version. The Duplicate Sweeper was created by the Wide Angle Software company. It specializes in applications for Windows, Mac, iOS and Android. 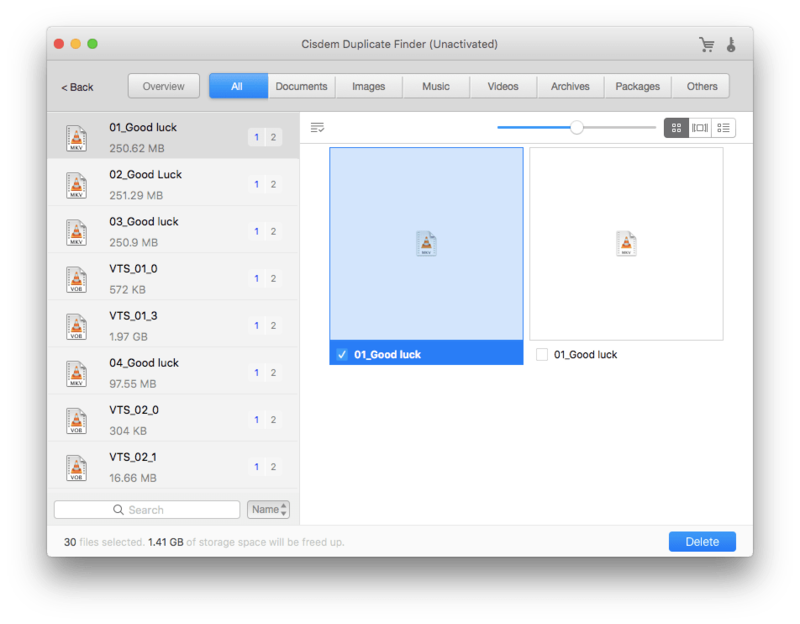 Duplicate Sweeper scans folder on your Mac and finds duplicates. You can download Duplicate Sweeper from the App Store for $8.99 or download its free trial from the Wide Angle Software website. 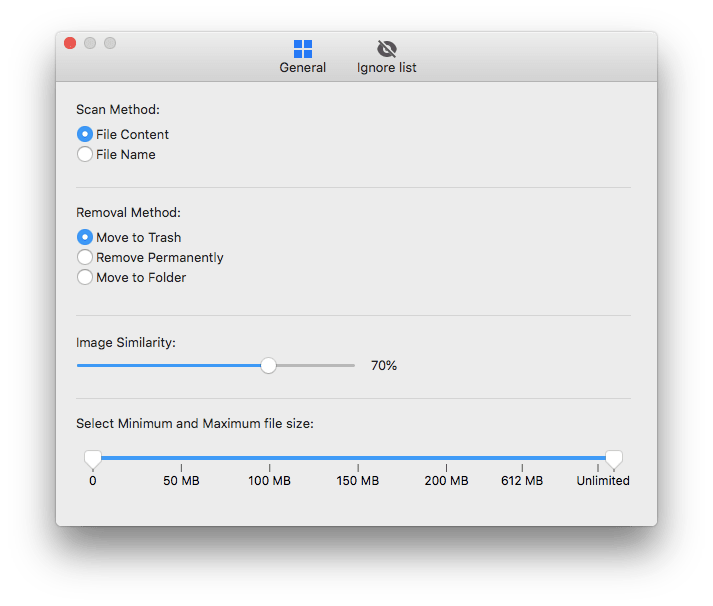 This duplicate file remover takes up 3.9 MB, is compatible with OS X 10.8 or later, and is simple to use: just add folders you want to scan and click on the Search for Duplicates button. The application will find and show all duplicates categorized by file types. Select useless twin files and click on the Trash Selection to remove duplicates. You will find this option at the top of the app’s main window. Click on the checkmark icon (Auto Select) to allow the app to choose duplicates of files automatically. Click on the Trash Selection button to overview the items you are going to remove and click on the Trash Duplicates button to delete them. You can manage the size of files you want to check and exclude some file types from scanning in the app’s Preferences. Note that the Duplicate Sweeper free trial does not allow you to delete duplicates. It is only possible in the paid version. The Dupeguru is a free application that was created by Hardcoded Software (rather, by one person). It is an app that works on iOS, Linux and Windows platforms. It scans your Mac folders and drives and finds duplicate files and folders. 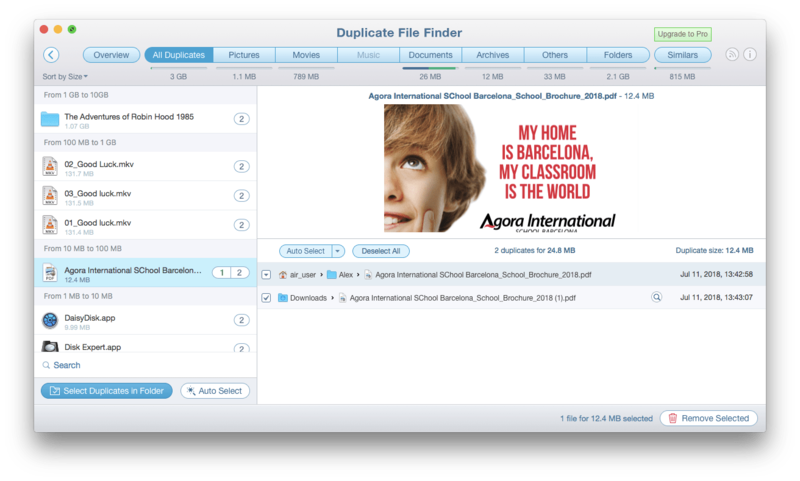 Dupeguru has a simple interface, takes up 4.5 MB, and is suitable for OS X 10.8 or later. You can download it from the Dupeguru app’s website. 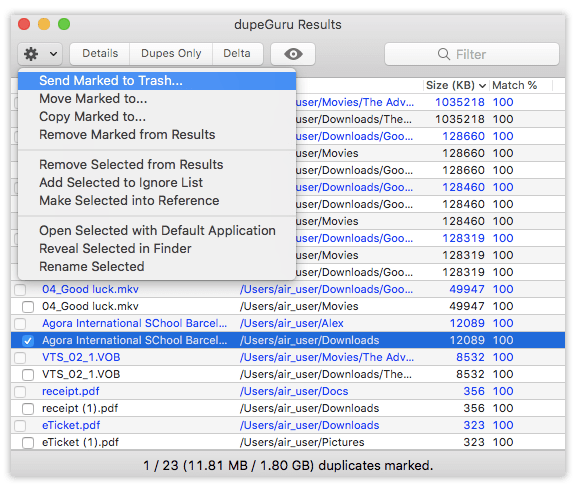 When you need to delete duplicates using Dupeguru, first select the Application Mode (Standard, Music or Picture) and choose the Scan Type (Filename, Contents or Folders). The app shows a list of duplicates, but it doesn’t have a preview section, so it may be inconvenient to compare files. To remove duplicates, you have to select them from the list and click on the Gear icon in the top left corner, then select Send Marked to Trash and click on the Proceed button. The Standard mode is the fastest way to find duplicates if you select Contents scan type. If you choose the Standard mode with the Filename scan type, there may be some confusion about filenames with numbers. Music and Picture application modes may take more time than the Standard mode. Often, we have no idea how many duplicates are on our computers, and they may take a great deal of disk space. Your Mac will run more slowly until you get rid of the duplicate junk. It is really hard to detect duplicates on your own, so the duplicate searching applications help in this situation a lot. We recommend Duplicate File Finder for this purpose, as it is the most powerful app with unique features and a comparably low price. It has great visual reports and offers intelligent hints. Also, It shows similar folders and even allows you to merge them. One more feature that other apps don’t have is the Select Duplicates in Folder option, which allows you to remove duplicates in bulk and save your time. And finally, it has scored the most points in our comparison chart. Anyway, have a look once more at the comparison chart at the top of this post and review the six most popular duplicate finders to make your own decision. However, there are lots of other applications in the Mac App Store, so of course, you may find another one which fits you best. If so, please contact Nektony team via email to share which features are most important for you in duplicate searching software for Mac. Prev:How to Empty Trash on iPhone?